Throughout Reconstruction, some armed whites terrorized African Americans who attempted to use their new rights to vote and control their own labor. The federal government investigated this widespread violence, and in 1870-1871 passed laws designed to protect the rights and lives of African Americans and their allies in the South. Within a few years, however, the commitment of the Grant administration (including Attorney General George H. Williams) to enforcing these laws waned. In this 1874 Harper's Weekly cartoon, an unrepentant southern rebel discovers the true nature of the federal government's commitment to defend African-American rights. Come on, boys! 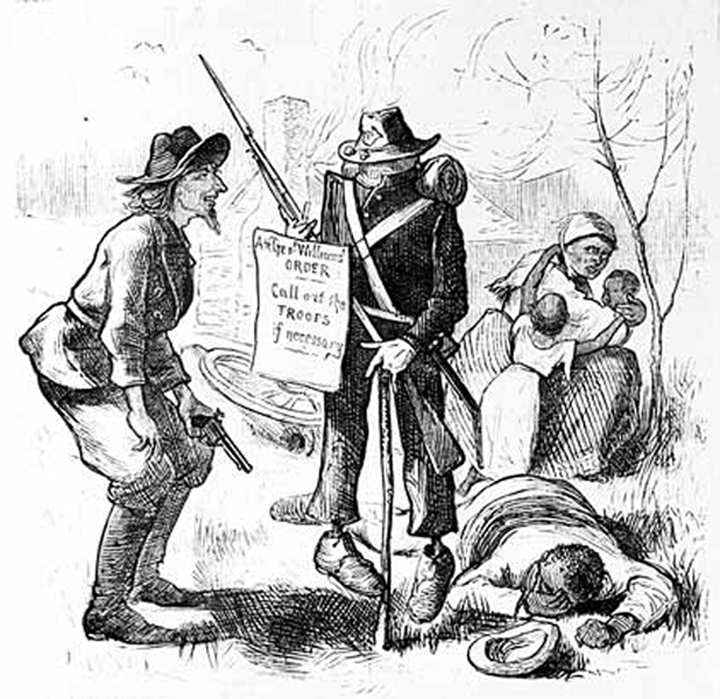 Old Grant's bluster about our killing Republicans is only a military scarecrow, after all. Source | Wood engraving, Harper's Weekly, 26 September 1874; from American Social History Project, eds., Freedom's Unfinished Revolution: An Inquiry into the Civil War and Reconstruction (New York: The New Press, 1996), 265. Cite This document | Unknown, “A Republican "Scarecrow" Fails to Staunch Southern Violence,” HERB: Resources for Teachers, accessed April 20, 2019, https://herb.ashp.cuny.edu/items/show/662.